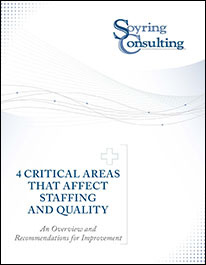 In our December newsletter and Dollars and Sense column, Are Staffing Levels Really a Root Cause of Poor Quality?, we discussed four key issues that should be reviewed more closely to determine whether they are impacting quality measures from a staffing or operational perspective: documentation, patient falls, medication errors, and inpatient readmissions. What do you need to know about these areas? What are the latest recommendations from peer groups and regulatory bodies? Download today to learn more about key quality areas and what you and your facility or system can do to improve in each one--ultimately leading to better outcomes and financial performance. Soyring Consulting provides managerial and operational consulting services to healthcare facilities of all sizes, including For-profit, Not-for-profit, Community, University, and Faith-based facilities and systems. One of our key areas of focus is quality, including case/care management, patient throughput, infection control, and survey preparation. Soyring Consultants are highly experienced in conducting quality assurance reviews in all aspects of the hospital and their effectiveness to sustain facility best practices, as well as ensure the department or hospital is consistent with administrative rules, licensing standards, and state regulations.